Sitting on a working coffee plantation of over 130 years comprised of 750-acres of coffee, ecological reserve in a mountain of 8,000 feet high, Filadelfia Coffee Resort & Spa captures Old-World charm while providing modern-day comfort. 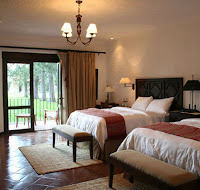 Filadelfia Coffee Resort & Spa offers a unique Guatemalan and Central American experience. The coffee plantation proudly produces some of the best coffee in the region, and the hotel would like to share the tradition of life on a coffee plantation with its guests. Rooms are spacious and decorated in warm hues and creams evoking Guatemalan elegant simplicity and feature very comfortable beds prepared with Egyptian cotton sheets. Most rooms offer a panoramic view of the Agua Volcano and the pool side garden. Contemporary lifestyle luxuries include iPods with sound bases, large televisions and WiFi connection. Pergaminos Restaurant serves international, beautifully presented gourmet dishes, and Cafetenango Restaurant offers delicious local dishes. The specialty, coffee-based drinks, are prepared with beans harvested from the hotel's own award winning coffee plantation. While staying at Filadelfia, you can enjoy the Coffee Tour, Mountain Adventure, Canopy, Mule and Horseback riding, tennis courts, fitness center or just relax in the temperature controlled swimming pool and jacuzzi. At Filadelfia Coffee Resort & Spa, guests can experience this tradition, while enjoying the comforts and services of a luxury boutique hotel with all amenities.